If you have lost a permanent tooth, you are not alone. It is estimated, 178 million adults in the United States are missing at least one tooth. When you have lost a tooth, your incomplete smile often causes your confidence to decrease while also impacting your quality of life. Just one lost tooth causes a significant impact on your oral functions and oral health. As a result, you must replace the missing tooth to complete your smile while preventing additional complications. Due to advancements in dentistry, you now have multiple options when it comes to tooth replacement. Among the most preferred option is a dental implant. 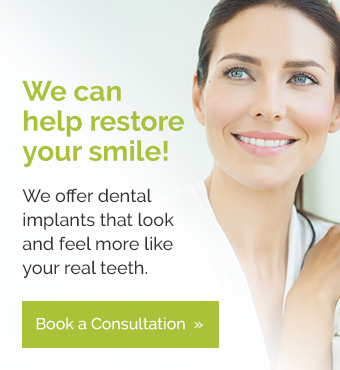 As your dentist in Grande Prairie, AB, we offer dental implants to restore your smile. Often, when a tooth is lost, many people do not understand the importance of replacing the lost tooth. Each tooth in your mouth plays a crucial role in oral health and oral functions. When even one tooth is lost, your teeth no longer work together properly. As a result, you will develop speaking and eating difficulties. However, the complications of a lost tooth extend far beyond just your quality of life. After you have lost a tooth, the underlying bone of the missing tooth is no longer stimulated. This causes the bone to start to deteriorate, which causes the adjacent teeth to lose support. Over time, this will cause the adjacent teeth to shift. As the teeth shift, the risk for gum disease and tooth decay increases. Not to mention, the adjacent teeth will eventually fall out due to the lack of support. Dental implants are the only form of tooth replacement to stop bone loss. In addition, dental implants are the only solution that is permanent. Plus, dental implants are the only option that most closely mimics the appearance and function of natural teeth. Dental implants are fairly unique because they replace both the tooth root and the tooth itself. Using a surgical procedure, a titanium post is inserted into the jawbone. This replaces the tooth root, allowing the underlying bone to remain stimulated. This stops bone loss and protects the remaining teeth. After the jawbone has healed to the implant post, an abatement is attached. The abutment is necessary to anchor the dental crown in place while also allowing the gum tissue to heal. A couple of weeks after the abutment has been placed, the custom-made dental crown is attached to the abutment to fully replace the missing tooth. All-in-all, dental implants offer a lifelong investment in your smile, quality of life, and oral health. You will not have to worry about adhesives, adjustments, or misplacing the tooth. If you are ready to restore your smile with dental implants in Grande Prairie, you need to contact Access Dental for a consultation. We will perform the necessary examination to determine if you are a candidate for dental implants to replace your missing tooth.